Apple's iPad Air 2 and Mini 3 launched with a very, very pleasant surprise: If you splurged on an LTE model, you could choose whether you wanted to jump on Sprint's, T-Mobile's or AT&T's networks (along with EE's if you're in the UK), with nary a SIM card swap in sight. It seemed pretty brilliant, really: you get the ability to pick a data plan that works best for you even if it's not from the same carrier each time, and Apple no longer has to juggle different iPad models for different carrier partners. Alas, if only everyone played by the same rules. 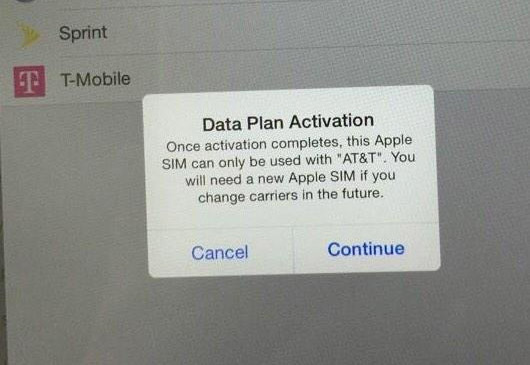 At first we thought the only caveat was that Verizon hasn't thrown its support behind Apple's split-personality SIM, but it turns out if you sign up for a spot of surfing with AT&T, you won't be able to switch to any other network without procuring another Apple SIM. Just lovely, no? Reports of AT&T's clinginess first started making the rounds on Twitter (see image below, courtesy of Twitter user @PilotMike), and Apple has confirmed to us that this is sadly just how the system works. Meanwhile, AT&T clarified its stance to Re/code, noting that while the iPad remains an unlocked device you can throw any ol' compatible SIM into, you're still on the hook for another Apple SIM card if you want to be able to play the field. When asked why AT&T chose to lock things down after activation, a carrier spokesperson told Re/code's Ina Fried that's "it's just simply the way we've chosen to do it." Going down this particular rabbit hole is AT&T's prerogative, but hey -- in doing so, it's only giving its rivals more ammo.